I really really want that mount. Who is with me? With Reins of the Cobalt Primordial Direhorn,Reins of the Armored Skyscreamer, Savage Raptor,Reins of the Black War Mammoth, and Sunstone Panther, your 5-man can now create the Megazord. Tucked away off to one side of the island is a small clearing. It is here we realize we’re able to begin the summoning ritual. With the chance at getting mounts, items, and rep-granting insignias our party chat fills with hopes for the coming kill. Suddenly, popping out of what can only be described as nether, a vicious brute by the name of Kor’dok appears before us. Before we have any time to consider our opponent the fight has already begun, and after an epic battle it concludes. A couple of us get bags filled with gems and enchanting materials, while the tank manages the unthinkable and wins a mount, a three-horned dinosaur formed of the darkest crystal, and guild chat erupts as he links his prize. Of course, nothing is definite until someone finds the mount. Confirmed as a drop off Oondasta according to mmochampion. Build 16634 will be deployed to the PTR realms soon. Nothing major in this patch, it is now confirmed that Reins of the Thundering Cobalt Cloud Serpent comes from Nalak and Reins of the Cobalt Primordial Direhorn comes from Oondasta. Cool . Another dino . It's the only drop available from killing Oondasta. I killed today (03.09.2013) the world boss. 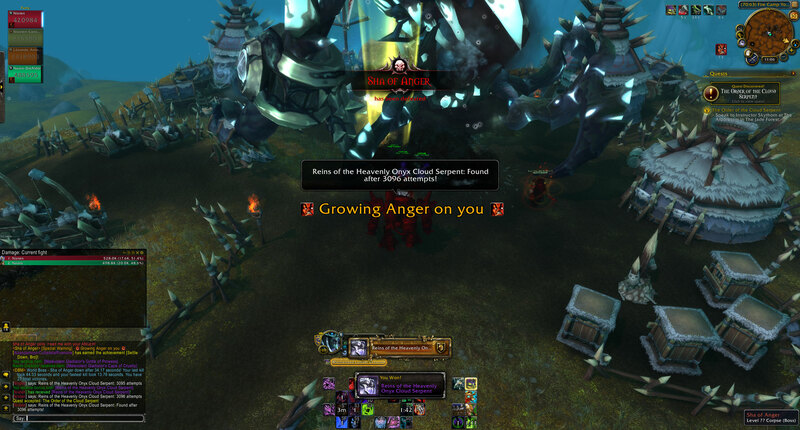 It still drops from Oondasta and it isn't bugged like Sha of Anger's mount! I killed this boss yesterday and recieved this mount, confirmed drop! Dropped for someone today. Heres a link to his armory. Dropped for me on my hunter today on a bonus roll. a guldie got this mount on our servers first kill, Dragonblight EU might just be a world first. Dropped for me on my mage on sunday on a bonus roll. 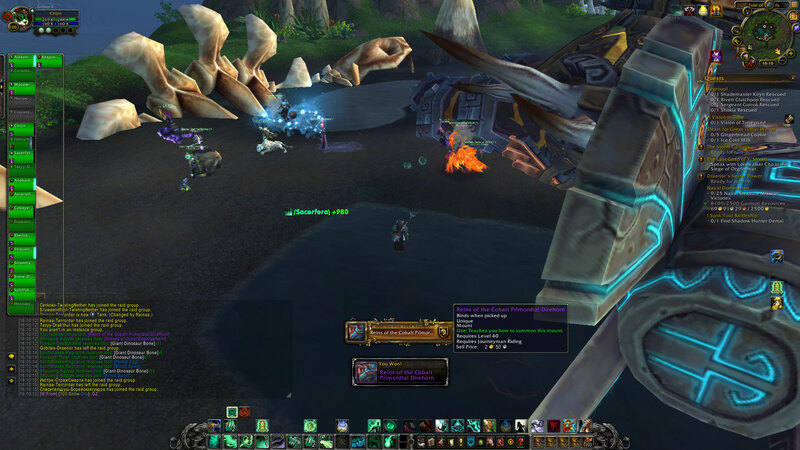 Found out Oondasta was up, flew to him and started attacking him while he was at 30% hp, after constantly dying and running i received this mount while a ghost (not yet ressed due to respawn timer) and it still dropped. Also i was not in the original raid group who started the raid and we were around 80 players killing him at the time. Bonus roll was gold. Got mine today on the bonus roll. 5Boxing Mages showing all angles in Nagrand. Just got this on my hunter. I'd never attempted Oon before, after ~5 deaths and an explanation to the raid (there were 2 raids, the first seemed to be more pro, the second, in which I found myself, was less so, and not completely full), we finally downed him. I got the mount somehow. Is there only one mount drop per kill? If so, I am extremely lucky. I did not get any gear loot, although after seeing the "congratulations, you won (the mount)" an opportunity for a bonus roll presented itself, and I hit "need." 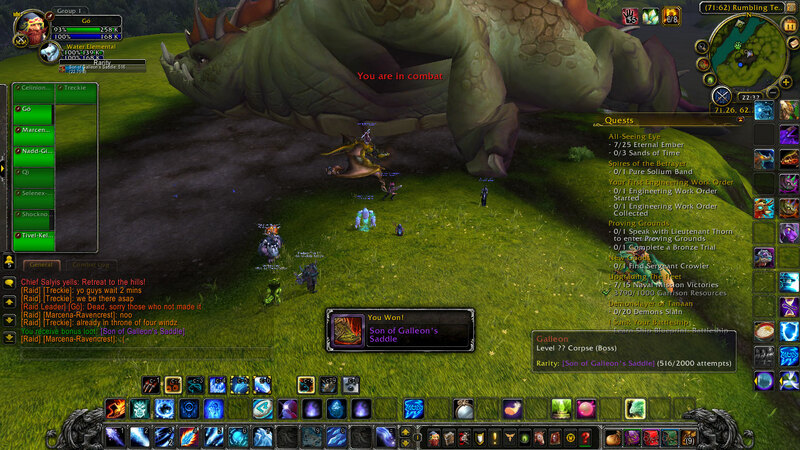 Nothing came of this - but I suppose I would have been too lucky had I won the mount and a bonus roll for loot as well! I won this on my Paladin today. TWICE. Around 11:30pm - Area 52. Received on Primary roll and Bonus roll. Such a beautiful mount, was very happy after seeing it had dropped for me when I joined an OpenRaid group for the boss. Just had this mount drop! Second time doing it this week.. I saw I had got the stupid Shiny Pile of Refuse and was disappointed.. coined it and almost peed myself when rarity flashed I had got it.. The whole moment is kind of hazy, lol. Love how you all downvote the guys celebrating about getting it when that's what idiots have come to do on wowhead for the last six years. coined it today after 230+ kills and tons of coin rolls across 7 characters (farming since panadaria release). 1 to go ... an easy one, Nalak. Such a relief. I got mine today in extra roll (coin), after 860 loots across all my alts. The most beautiful of all Direhorns. As of lately this boss is impossible to camp and kill especially if you have more than 1 character. As this poster in the WOW forums has posted, blizzard needs to really fix his 2hour respawn timer. Rumours say that Worldbosses can drop mounts, I don't believe it. After Many hours waiting and grinding timeless isle for bonus rolls on 22 level 100 characters, my efforts are finally rewarded! I just want to say to anyone camping Oondasta, I know it feels like hell and that it won't ever drop. But keep your head held high and your hopes up, as this drop just took me by complete surprise. And best of luck farming :)!. I manage to kill all world bosses on 11 lv 100s before saturday hits while still studying and attending university , how? 2-Go to custom groups and check the auto-search box with "Gal" for Galleon or "Oonda" for Oondasta typed , remember also to search non english realms. 3-Thursday and Friday have the highest amount of groups (wednesday too, but most of the times they are dead due to burst damage unless you go right after reset) with an average of 30-45 min for all 4 MoP world bosses. Remember to start a group yourself if one of those spawns on your realm , that people who ask for a summon and ! @#$% about losing the boss aren't worthy of a reply and you better be at spawnpoint yourself before starting (most groups will have the bosses die within the first minute). DO NOT start or join a group unless they are spawned or you have a timer about to hit the 2 hours mark ,unless you want to waste your time, 90% of the times a group with an alive Oondasta pops up while you're chilling in a "Going to spawn soon" group. Received this beautiful mount today after a long grind of 14 attempts. The wait was worth it! Killed him randomly on my second hunter farming the manual for direhorn taming and the reins dropped, too bad I already had it, tried to trade it to someone else that was there for the kill and couldn't, pretty lame. Long story short. Started doing world bosses on 11 characters back in september 2015. Now I am doing it on 55 characters at level 100 with bonus roll, always. Finally my first world boss mount and mount number 353 was Reins of the Cobalt Primordial Direhorn Got it 10/9/2016 after 2210 attempts. That happens on Sha of Anger and Nalak. It means that you won a bonus roll for gear, and since there's no gear for demon hunters on their loot tables, given that all the gear items are class specific and they were not in Pandaria, you're getting your coin refunded instead. It is expected that you'll be getting a propper message on 7.1 because it was changed via hotfix and new messages are usually added in patches. You should no longer be getting this message as it was fixed on 19th of October. 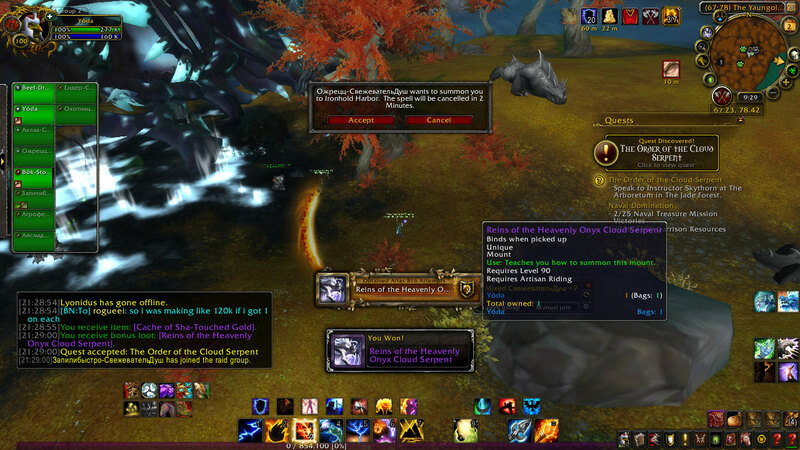 User Argonized reported a screenshot getting Reins of the Cobalt Primordial Direhorn from Oondasta on a bonus roll. I encourage you to vote his post as it has provided the proof for this matter. So about 700 kills on this, about 50 kills every single week, plus bonus rolls, so a total of 1.400 attempts, only started since the respawn was fixed (15 min instead of 2h), plus assumably 90 kills in mop already included in the total. For the first 4 weeks in which I farmed, which were still technically wod groups were still possible to make, which helped confirm the drop rate: we can assume an average of 5 people in group per kill and first week I saw 1 get the mount, 2nd week I saw 2 different people get mount, 3rd week no one got it, 4th week 1 got it, which would hint to a drop rate of 1 in 230. My assumption was 1 in 400, which is why I started farming this, unlike galleon (1 in 2.000 and hoping to buy that from BMAH), sha or nalak (1 in 2.000, and that's why I capped them without doing serious farming back in wod, 953,5k and 999,3k gold), but I already got into unlucky territory, like 4 out of 5 people who do the kills I did would have mount by now (if drop rate is correct, which seems to be). Obviously I have some chars almost ready on 2nd account, so that will be a total of about 80 kills per week when, in a few weeks, my new ones will be ready too. Usually this weekly farming takes me 3 hours and 30 by using several crz, usually 4 different ones, so that I can do 4 kills in 15 mins when things go right, a friend of mine helps me with those realm hops by keeping 3 chars (from 3 different realms) on isle to invite me in the right crz group. However tonight I had to do it solo and took me about 6-6,5 hours which for 48 chars isn't too bad, but this mount is time-consuming in the sense that it has the potential to take A LOT of weeks\months even with many chars, doesn't take that much weekly time however. I only see people getting this in max 1.100 kills + 1.100 bonus rolls, as in 2.200 total attempts, but I am now at 3.800 total and still nothing; so I'm starting to wonder if this is a bug where some accounts are unable to get world bosses mounts due to the way they drop (appear in bag). On this matter, anyone did over 3.800 attempts (counting both kills and rolls) on oondasta before getting it? I know it's possible to need more tries for other world bosses mounts, but talking specifically about oondasta, and not interested in "it's possible, it's rng" answers, I'm simply asking: did anyone REALLY need over 3.800 attempts for this? Ok, it's over! Started farming this in mop with 5 chars, but very little farming back then, only estimating around 90 kills before I got tired, all with bonus roll obviously but I was tired that everyone else got this mount while I was the only one making groups (this also goes for the other 3 mounts from mop world bosses), also respawn was 2h and it took a lot to get enough people to kill it back then. Then I first soloed him in June 2.015, it was the last day before patch 6.2, used my main dk as blood (level 100 ofc, and 690 item level, took 6 mins, was hard and just before they nerfed breath of sindragosa), respawn was still 2h, so haven't bothered doing him for anything but challenge. Then in August 2.016 they finally fixed the respawn to 15 mins, started doing it with 46 chars every single week (with bonus rolls always ofc), slowly brought some chars to 101 to make sure I could solo him, although it took 5 mins as blood in 700 item level; during the first 4 weeks of August, level cap was still 100, so I could make groups; as soon as Legion released in september it became impossible to get people interested in oonda, I just had to do it every time with random people who happened to be there in the crz I was on. During August, in my 200 kills or so, 4 mounts dropped for other people, including a friend of mine who then helped me doing those kills even after she got it for most of my remaining farming. Later on, I started levelling some of my chars on 2nd account, most were dks ofc, and I slowly reached the maximum amount of 81 chars killing him every week, it was totally doable time-wise, because I play on A LOT of different crz, so I could kill him even solo with level 101 4 times every 15 mins, I just had to note down the time he was killed at in each crz and I could just relog a character on the one he was about to spawn, there were almost always 110s around. 110s, even in incredibly low gear (780) can kill him incredibly quickly, as a quite experienced frost dk I could kill him even in 43 seconds in 780 item level, though obviously some classes (priests) may need more item level to kill it as fast. As months passed I got past every oondasta record, I thought Niixten who had 2.200 total attempts (rolls + kills) before he got it with 55 chars had established an unbreakable record, then I found a certain Skate or something similar, a druid who had 2.400 total attempts, and then searching the top 100 collectors I found Chanks, who had only around 10 chars but an incredibly high kill count on oonda (like 130-170 kills on each), for a total of 2.800 attempts. But I had to keep killing him even past this amount, it just never dropped, and I thought there was something wrong, a bug, where some specific accounts will never be able to drop any of the mop world bosses mounts. I thought that till today, when after 5.351 total attempts, so 2.676 kills (it dropped from a normal roll, that's why I don't count the final bonus one) it finally dropped tonight at the 38th kill of the week! So no, it's not bugged, it's probably a 1 in 1.000 drop, so having a bit over 5.000 kills is a case that will only happen to around 1 in 200 people, the rest will get it earlier. So at last it's over, other 3 mounts costed me 3,35 mil gold total and only 1.200 total rolls before I realised I shouldn't farm them, so I don't regret buying them and I only farmed oonda cause it was not on BMAH database! It's a testament to the tenacity of mount farmers that now, in May 2017, that Oondasta and the other Mobs that drop Direhorn mounts are camped 24x7 still. If you want to depress yourself and see how many times you've killed Galleon, Sha of Anger, Nalak and Oondasta in attempts to obtain their impossible mounts, you can can use this script to see kills by world boss. so im trying to get this mount but can sum1 tell me can i only kill the boss once a day or once a week or as many times as possible a day? I just got this beauty three days ago. I was too surprised because it was my rogue's first attempt to farm this mount and I just got my rogue reaching 110 level that very day. Just got this mount after 2364 attempts, 2 days after Solar Spirehawk !